Carl Friedrich Förster (1861) Hamburger Gartenz, 17: 160, as Echinocactus islayensis. 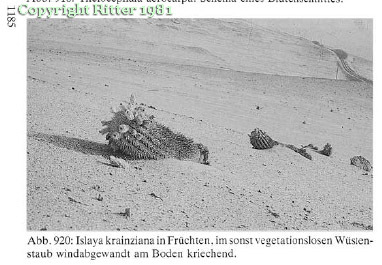 Fred Katterman (1994) Succulent Plant Research, 1: 117, as Eriosyce islayensis. Image above is from Ritter. I have not been able to locate who owns Ritter’s copyrights so have not obtained permission for the use of this image. If someone can provide information on how to organize formal permission it is most welcomed or if the presence is objectionable it will be removed promptly. According to Anderson 2001, all of the former genus Islaya has been merged as a highly variable Eriosyce islayensis (C.F. Förster) Katterman. Habitat: Arid, dry desert regions with little rainfall. Mineral rich alluvial sediments, on sand dunes and exposed windy slopes. Most moisture is derived from fog. Forms simple (unless apically damaged) short plants up to 13 cm tall and 7 cm wide. Ribs are 6 mm in height and number around 17. The areoles initially bear whitish-grey felt. Spines are rigid black, later becoming grey. There are 20 to 24 six mm long thin radial spines and 4 cruciform (usually) centrals which are stouter, thickened below and up to 18 mm [20 mm] long. 3/4 inch [2-2.2 cm.] 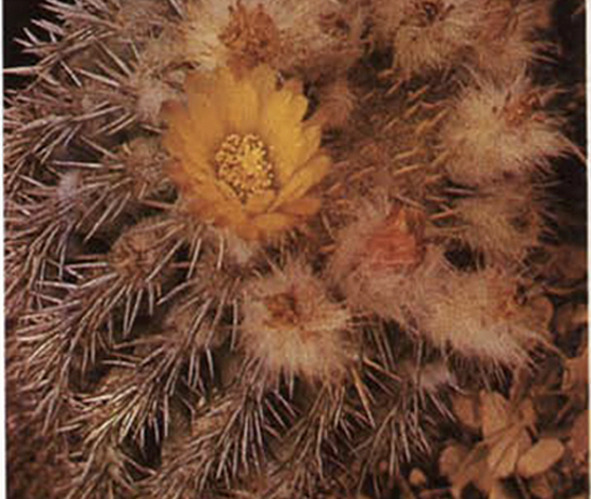 flowers arise from the felted area and vary from golden to light greenish-yellow. Hairy, carmine fruit starts globular and ripens elongated. Perianth and a few bristles persist on the top of the fruit. These are represented in collections as beautiful but small and slow growing specimens. Backeberg notes that wild collected plants of Islaya are sometimes difficult to grow.